Since the LSJ has picked up on this, this morning, I'll give it it's own thread. 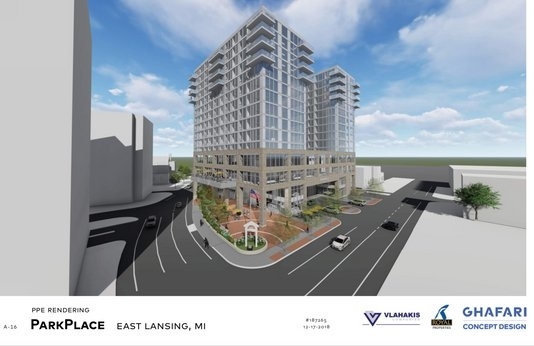 EAST LANSING — Developers want to build two new high-rises in downtown East Lansing and a movie theater, as well. Okemos-based Vlahakis Companies and Royal Properties of Champaign, Illinois have proposed two buildings near the corner of Abbot Road and Albert Avenue that would hold 235 apartments and 28 condos. The new project, called "Park Place" would be a mix of studio, one-bedroom and two-bedroom units. Preliminary plans also call for automated parking and retail and office space. The developer would tear down the current Dublin Square building and reincorporate the bar and restaurant into a new building. The plan calls for one 13-story building at the corner of Abbot Road and Albert Avenue, which would replace the current Dublin Square site. That building would have about 25,000 square feet of office space. A second, 10-story building that would have a movie theater on the first floor would sit adjacent to the first along Evergreen Avenue. The two buildings would be connected by a skyway over the alleyway. Interestingly, Vlahakis says that even if he can't get the DDA land for the full project, he'll definitely be redeveloping the Dublin Square site, which he owns. That second rendering is new. 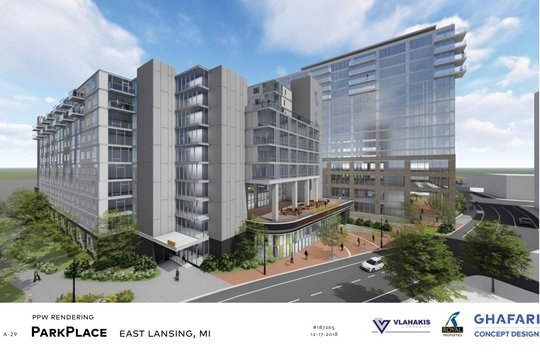 Vlahakis is not required to build parking in the city center zoning district so just the Dublin Square site would be allowed if he is granted a variance for going over 12 stories. I was kind of sad to hear they want to keep the restaurant[really bad food] and knock down the building. I would do it the other way around. It will be a very busy corner of town I am wondering what would be a good idea for the streets to keep traffic moving through the new highrise zone. I have had this fantasy idea of building a through-traffic tunnel from Harrison to Hagadorn under Michigan and Grand River Ave. but that seems unlikely. I wonder how they are planning on handling this? The best way to handle the increased traffic is with improved mass transit and non-motorized transportation, which will take local traffic off the streets and have more people riding together and taking up less space. He'd have to rework Park Place 1, though, if he didn't get the DDA land, though. The city actually owns the small parking lot at the northwest corner of Abbot and Albert, and you can see in the rendering the current Park Place 1 proposal would extend to the corner. It'd be a pretty significant reworking of that building if they have to use just the Dublin Square site. You'd likely have to take out the light-court. This one seems to be moving tentatively forward. Vlahakis has submitted a letter of intent to the DDA to buy the properties that would make up the project. The DDA has many concerns, but they are doing their due dilligence on this one to see if they can make this purchase agreement work. This is for Thursday's DDA meeting, at which time we'll see Vlahakis will respond to these demands by the city and DDA. The city/DDA is underwater on these properties, which is why there is pressure to unload them. At the same time, they don't want to be taken as suckers. Hopefully, they've put Vlahakis on record and they responded with respect. Not only is the DDA underwater, there is a large balloon payment due on the loans soon so they have their backs up against the wall. If they don't sell, they will have to refinance again and increase their debt even more. I don't understand all the math having not really pored through this, but it does seem that there is a lot of pressure unload this land very soon. I just don't want the developer to put them even more over the barrel than they already are, but this is hardball. The city council is asking for futher materials from the developers for their next meeting, which in addition to the draft purchase agreement being ironed out tells me they are seriously considering to sale the land. Interesting drawings of this project in the LSJ today. It looks like this one is going to start soon. I like that they seem to have a bolder more current modern design for these tall buildings. Ann Arbor is going to be blue with envy! Thanks for mentioning the new renderings. I wouldn't have noticed it otherwise. I like the large public space that both buildings offer. I think these plazas will help pull people towards the park and back to the downtown. These could get some great use during festivals too.